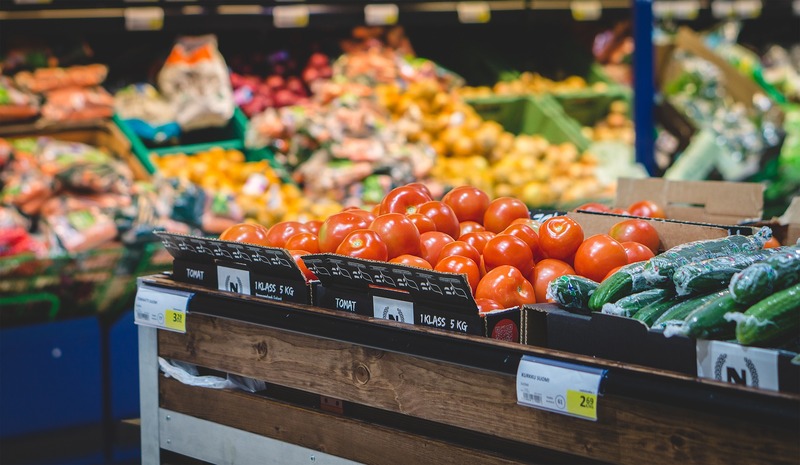 Worryingly, the Fruit, Vegetables and Diet Score Report released today, found one in two (51 per cent) adults are not eating the recommended intake of fruit, while two out of three adults (66 per cent) are not eating enough vegetables. The Fruit, Vegetable and Diet Score Report, produced by the CSIRO and commissioned by Horticulture Innovation Australia, compiled the dietary habits of adults across Australia over an 18 month period. With 145,975 participants nationwide, this survey is the largest of its kind ever conducted in Australia. The overwhelming message is that most Australians are not as healthy as they think, and need to eat higher quantities and a greater variety of fruit and vegetables every day to meet the minimum Australian benchmark. To help meet the benchmark, CSIRO suggests adults eat at least three serves of different vegetables every dinner time. "Many Aussies believe themselves to be healthy, yet this report shows the majority of those surveyed are not getting all the beneficial nutrients from fruit and vegetables needed for a healthy, balanced diet," said Professor Noakes, CSIRO Research Director and co-author of the CSIRO Total Wellbeing Diet. "For a country with an abundance of high-quality, locally-grown fruit and vegetables available all year round, it’s disappointing so many Australians are missing out and not enjoying enough variety in their diets," said John Lloyd, CEO Horticulture Innovation Australia. "One simple way to boost your intake is to eat three different types of vegetables with your main evening meal," said Professor Noakes. "Australian growers are adapting to the consumer's need for convenience by bringing high-quality fresh produce from the farm to the table in ready-to-cook and eat packaging, making it easier for time-poor adults to add more nutritious fruit and vegetables into their diets," added Lloyd. Women reported slightly better fruit and vegetable consumption with 24 per cent meeting both guidelines, compared with only 15 per cent of men surveyed. "Increasing the amount of fruit and vegetables we eat is one of the simplest ways Australians can improve their health and wellbeing today as well as combat the growing rates of obesity and lifestyle diseases such as heart disease, Type 2 diabetes and a third of all cancers," Professor Noakes explained. "Diets high in fruit and vegetables have been shown to improve psychological and physical markers of wellbeing. In particular, phytochemicals from fruit and vegetables reduce systemic inflammation which can lead to chronic disease," said Professor Noakes. To find out how your diet stacks up and if you’re eating enough fruit and vegetables, take a few minutes to complete the CSIRO Healthy Diet Score survey – a free online questionnaire which evaluates diet quality and identifies individual areas of improvement, as well as providing a personal diet score out of 100. The median intake of fruit and vegetables as outlined by the Fruit, Vegetables and Diet Score Report. 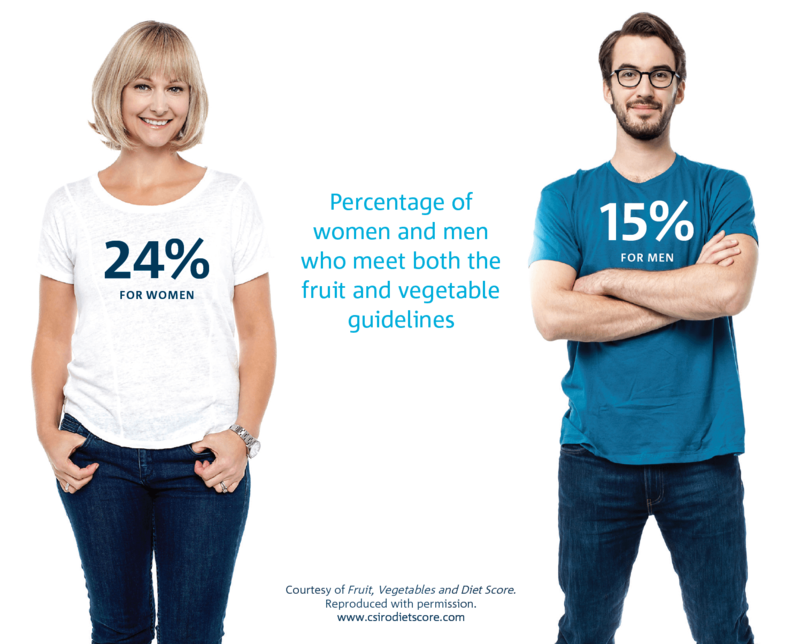 The percentage of men and women who meet both the fruit and vegetable guidelines. 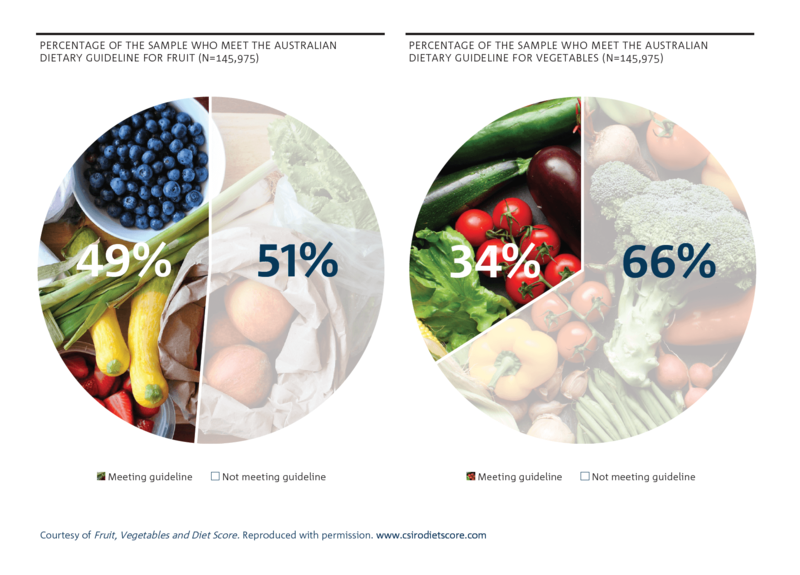 A breakdown of the percentage of participants who meet the Australian guidelines for fruit and vegetables. 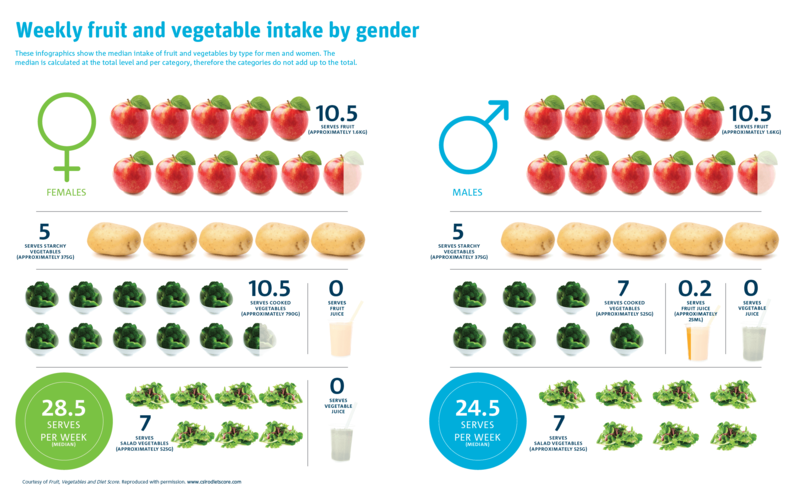 A summary of the weekly fruit and vegetable intake by gender. The Fruit, Vegetables and Diet Score report describes a sample of 145,975 Australian adults who have completed the CSIRO Healthy Diet Score online survey between May 2015 and October 2016. The CSIRO Healthy Diet Score is a scientifically-validated food survey designed to assess compliance with the 2013 Australian Dietary Guidelines (ADGs) and Australian Guide to Healthy Eating (AGTHE). The survey questions ask about frequency and quantity (in servings) of consumption of fruits, vegetables, grains, meat and alternatives, dairy, discretionary foods (cakes, confectionary, processed meats, alcohol, take-away foods) and beverages, as well as addressing the quality of core foods (frequency of wholegrain and reduced fat dairy) and variety within core food groups. Horticulture Innovation Australia is a grower-owned, not-for-profit company that delivers more than $120 million in research, development and marketing activities across the horticulture industry each year with funding from the Australian Government, grower levies and other sources.